Mercure Hotel Orbis Munich South. Book your hotel now! The Mercure Hotel München Süd Messe is surrounded by forests and has good transport links to Munich international exhibition center and city center. The spacious 4-star hotel has CBH and CCH certification and features modern architecture in its 185 hotel rooms and 13 meeting rooms. Enjoy a wide range of culinary delights in the "Sparks" restaurant. The "bubbles" bar and the courtyard beer garden are there for your enjoyment and relaxation. The Mercure München Süd Messe team looks forward to your visit! Munich-Perlach in the south east of the city is a district that has grown organically over centuries: as far back as the year 600 there was a church here. Today Perlach is loved for being a quiet residential area - and a location for major companies. 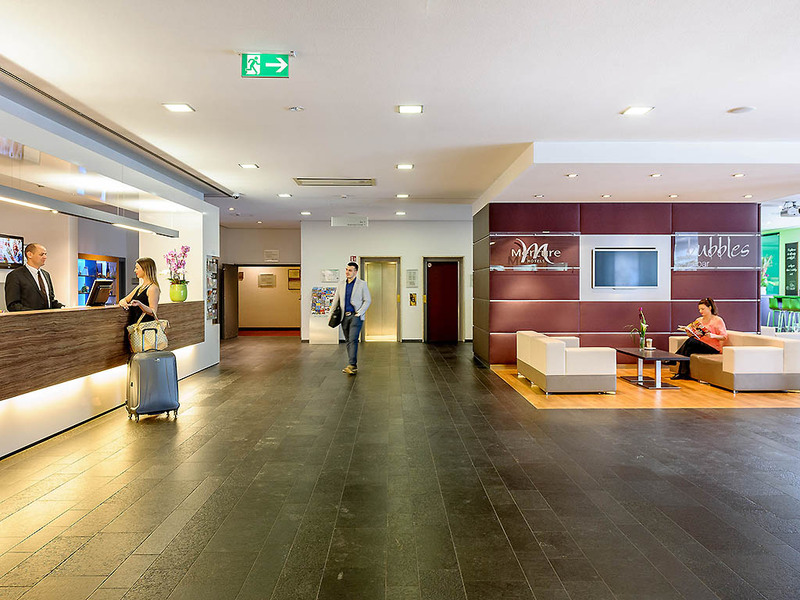 At the 4-star Mercure Hotel München Süd Messe, you can choose between Standard Rooms with single bed, twin beds, queen-size bed or queen-size bed and sofa. Our Privilege Rooms have a queen-size bed and the Privilege Suite has a king- size bed and sofa. We have one specially adapted room for guests with reduced mobility. The 185 rooms are air conditioned and have free WIFI. A child up to 12 years can sleep in their parents' room for free. Pets welcome (surcharge of EUR 11/night). Our Biergarten bar is in the inner courtyard of the hotel, in a quiet area. Enjoy the outdoor setting while sipping on a Bavarian beer. Other regional beers are also available. Our "bubbles" bar is located in the lobby and enjoys the same contemporary design as the rest of the hotel. Take a seat and enjoy a cocktail, a cold beer or a glass of wine. We are open daily from 6pm to 1am. As a platinum Accor rewards member, I have seen much better. This hotel didn't seem very organized. The facilities were adequate, but definitely wouldn't consider it a 4-star hotel. The room smelled like it had been a converted smokers' room. The reception didn't know I was arriving late, even after I made a note in my reservation, and the breakfast staff had no clue that I had already paid for breakfast. All in all, it was a decent 2 nights, but nothing earth shattering and I would look for a different hotel in the Munich area in the future. The breakfast staff reprimanded guests for taking glasses from a tray with the brusk text of &quot;this is for the disabled people&quot; instead of phrasing that more politely. There was no sign there. Besides, disabled athletes can get glasses from the regular trays just as well, too. Also, the breakfast staff was slow to move chairs away from tables for the wheelchair athletes to sit - I did that! Furthermore, the two ladies did not manage to set tables again after other guests left. New guests did this for themselves. Their overall competence and friendliness were wanting. The ventilation in the bathroom was pretty loud. In room Königssee the conversations from the next room were quite loud to hear. Everything else was very good, I'd come back. Room was okay, only the air refresher-level was too high, maybe had smoked in the room before or so. Breakfast, Lunch an Dinner were good. The conference rooms were okay, the beamer went to quickly into the energie-saving mode. The WLAN was a bit instable and slow in the rooms. Everything correct, but I would like to remark as an improvement: room service is until 21.30 and bar until 22.00. I arrived from the airport at 22.30 and only some sandwich were available. I propose to have a longer room service. Very quick check in. Breakfast time is very crouded. Hard to find single place to sit. Great hotel if you want to be sporty and have a good room. Good food in the bar and a sauna as extra! I want: - good wifi connection - good nights sleep - good glutenfree breakfast - good bar (if I have time for it) - Nice treatment from staff - close to Siemens Office You delivered all of it except for number one. The wifi should be very fast and free, it's &quot;only&quot; fast. I have been staying at this hotel in Munich for years, the location is suitable when you have to attend a fair, it is 10 minutes by car and the hotel provides a free shuttle in the morning. I liked the restaurant more when the Tavern was open, still I can handle it easily at the bar, where staff and menu are very fine. The rooms are nicely decorated and comfortable. All amenities like TV, Wifi etc. are working well. The breakfast is tasty with a wide choice of items. Very friendly staff at the reception. The room and appliances were generally ok, however the room was very cold at the first entry - outside temperature during my stay were somewhere between -8 to -5 and the heating in the room was off. I spent 2 days at your hotel and the cleaning lady turned the heating off again on the second day so when I returned to the room it was cold. Also, used towels which I didn't place on the floor in the bathroom because I planned to use them again were taken and replaced with fresh ones (this would not be a problem at all, but I assumed every modern hotel now wants to go green). Otherwise the stay was OK. I was satisfied, it seems to me that the breakfast quality was improved and also the staff was more supportive this time.